Bosnian Muslims gather near a graveyard to pay respects and lay to rest the late Hatidza Mehmedovic, in the village of Suceska, near Srebrenica, July 25, 2018. Hundreds of people on Wednesday attended an emotional funeral service for Hatidza Mehmedovic, who headed a group of women fighting for justice for the victims of the 1995 Srebrenica massacre. The somber crowd stood in silence and many cried during a commemoration ceremony and a Muslim religious service held in the eastern Bosnian town that was the site of Europe's worst carnage since World War II. Mehmedovic, who headed the Mothers of Srebrenica group comprising women who lost their loved ones in the massacre, was buried later in a village near the town. The Mothers of Srebrenica have won praise for their struggle to have those responsible for the killings brought to justice. 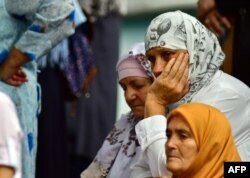 Bosnian Muslim women are seen while people gather in front of the central mosque in Srebrenica to pay last respects to late Hatidza Mehmedovic, July 25, 2018. "Today we are all sad, everyone who knew Hatidza, everyone who knows what the word 'mother' means," said Munira Subasic, another women heading the quest for justice. "She wanted to send the message of peace, message of respect to others. She was seeking only one thing and that was the truth and justice." Mehmedovic's husband, two sons and brother were among some 8,000 Muslim men and boys killed when Bosnian Serbs overran Srebrenica in July 1995. More than two decades later, experts are still excavating victims' bodies from hidden mass graves throughout Bosnia. The U.N. war crimes tribunal for the former Yugoslavia has sentenced Bosnian Serb wartime leader Radovan Karadzic and his military commander, Ratko Mladic, over the Srebrenica massacre and other atrocities of the 1992-95 war. Although an international court has labeled the Srebrenica killings as genocide, Serbs have never admitted their troops committed the ultimate crime and nationalist politicians have viewed Mladic and Karadzic as heroes. A Serbian far-right lawmaker, Vjerica Radeta, has sparked outrage this week with a tweet mocking Mehmedovic's tragedy after her death. The tweet was widely shared on social networks and reported by the media before it was deleted, and Radeta's Twitter account shut down. Serbia's parliament speaker Maja Gojkovic has said Radeta's position does not reflect that of the assembly.